These lovely chicken medallions with fragrant saffron sauce was part of the special Thanksgiving meal. Well, my family was delighted to see this gorgeous colorful platter. 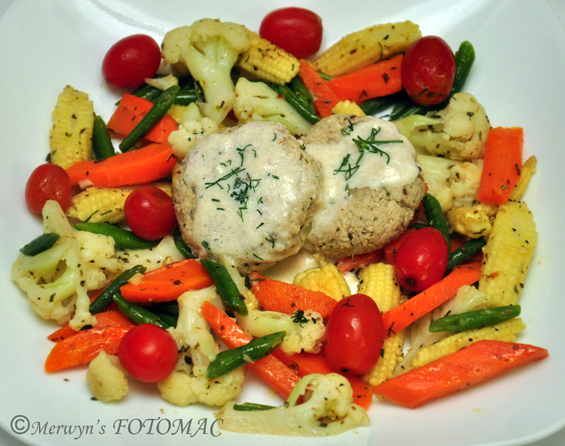 The chicken medallions were poached with some veggies & lightly spiced with a mix of Indian spices. The highlight was the saffron sauce which was creamy & smooth with a hint of saffron & dill. Dill is a herb with a very strong flavor & should be used in moderation. It has great culinary uses, medicinal & health value, is rich in vitamins & minerals. In India, especially in Maharashtra it is cooked as a vegetable/subzi & eaten with Indian breads (rotis, phulkas & bhakris). Place the chicken pieces in a sufficiently large & deep pot/dekchi/handi. Add in about 3 cups of water, salt & bring it to a rolling boil. Skim off the floating impurities & then add in the diced onion & carrot, celery stick & the spices. Poach the chicken till the chicken & the vegetables are cooked & tender. Let the chicken steep in the juices for about 30 mins. Separate the chicken pieces; debone if using chicken with bone & process in a food processor/masala grinder/blender till chicken is mashed & fairly smooth. Keep aside. In a pan, heat butter. Saute, garlic, chopped onion bulbs, red chili flakes, cumin pwd., spring onion greens & parsley/coriander leaves. Add the pulsed chicken, wine & seasoning to taste. Stir till well blended. Remove from heat & set aside to cool down completely. When cool, mix in the white sauce thoroughly. Divide the chicken mixture into portions & shape into medallions & keep aside. Heat the milk with the saffron strands to bring out the saffron flavor & then add cream. Check the seasoning & allow the sauce to thicken over low heat. Keep warm to retain pouring consistency. 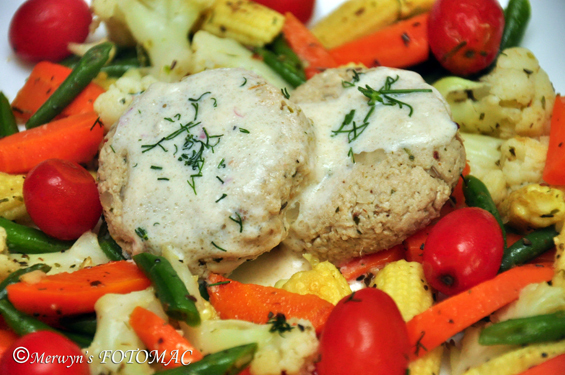 On a serving platter or individual plates, arrange the chicken medallions encircled with sautéed vegetables & cherry tomatoes. Pour saffron sauce over the medallions & sprinkle some more dill if you like. Serve immediately. Do not discard the chicken & vegetable stock as it can be used for soups or even in pulaos, biryanis or any dish which calls for stock. Use dill/sua/shepu sparingly as the flavor of this herb is very strong…excessive use will overpower the final dish. You can fry the medallions if you like. Any combination of your favorite vegetables may be used. The use of butter or oil is purely up to you.